The Platform Installer requires internet access which may not be available in a production environment. The Platform Installer setup.exe will fail on Windows servers that have IE Enhanced Security Configuration enabled. Use the NServiceBus PowerShell Module to install any required prerequisites. Download and run the individual installers from downloads rather than installing via the Platform Installer. The Platform Installer is a Microsoft Click-Once application, which means it has a built-in self-updating mechanism. Click-Once applications are sometimes blocked by corporate firewalls or software restriction policies. If the Platform Installer fails, review the Offline Install page for installation instructions. The Click-Once setup.exe will install .NET 4.5.2 if required and will then bootstrap the Platform Installer application. Before proceeding with product selection, the Platform Installer will prompt to accept the NServiceBus license agreement. The Platform Installer requires internet access to download individual packages. 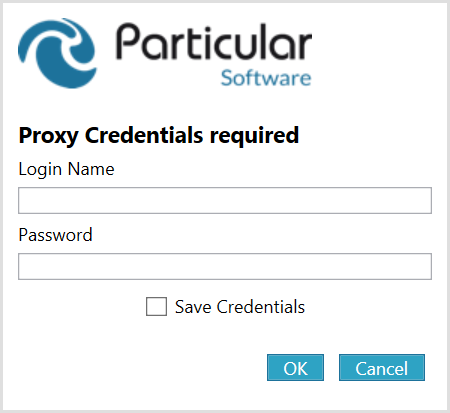 If non-Windows integrated proxy authentication is required, a credentials dialog will be shown. This dialog offers to save credentials for future use. If the Save Credentials option is chosen, the credentials will be encrypted and stored in the registry at HKEY_CURRENT_USER\Software\Particular\PlatformInstaller\Credentials for use in subsequent launches of the Platform Installer. The Platform Installer will prompt for the items to install. Individual components can be selected for installation or upgrade. If the latest version of a product is installed, no checkbox will be displayed for that item as there is no installation or upgrade action required. Similarly if the Platform Installer cannot communicate with the version information feed, it will also disable product selection. This installation runs the appropriate Deployment Image Servicing and Management (DISM.exe) command line to install the required Windows Features for Message Queuing (MSMQ). The installation will also check to ensure that any unsupported MSMQ Windows Features are not installed. This installation is required only if MSMQ is going to be used as the message transport. The other supported message transports are detailed in the transports documentation. Enable Network DTC Access. NetworkDtcAccess is set to 1. Installs the ServiceInsight application. This MSI can be downloaded directly from the ServiceInsight releases page. Installs the ServicePulse application. 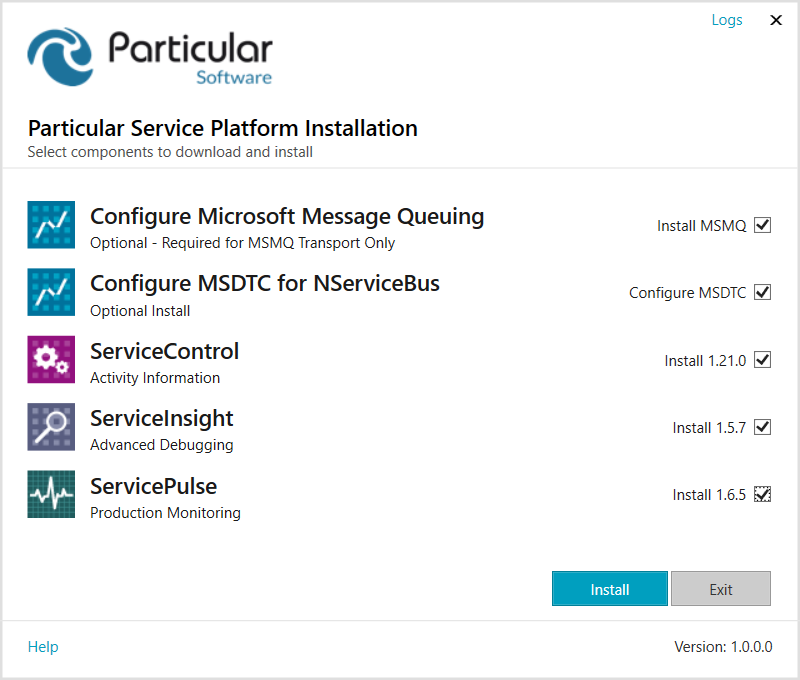 This MSI can be downloaded directly from the ServicePulse releases page. Installs the ServiceControl application. This MSI can be downloaded directly from the ServiceControl releases page. The Platform Installer caches the downloaded MSI files in %temp%\Particular\PlatformInstaller. These files are downloaded directly from GitHub. Some corporate firewalls prevent the downloading of executable files via content filters or by white/black listing specific web sites. If the Platform Installer cannot download the individual applications, consult with the network administration staff. The Platform Installer logs activity in %appdata%\PlatformInstaller. The current log file will be named according to the current date. For example a log created on January 25, 2018 would result in the filename log-20180125.txt. The command line options used for the MSI installations ensure that a detailed log file is produced for each installation. These files are located alongside the Platform Installer logs in %appdata%\PlatformInstaller. An installation or upgrade of a product will overwrite any existing MSI log for that product. MSI installers provide detailed error information via error codes. MSI error messages can assist in troubleshooting installation issues. As mentioned above, in some circumstances Click-Once can be problematic. The following links provide some useful tips on troubleshooting issues with Click-Once. Resolve this by (temporarily) disabling IE Enhanced Security. How to install the Particular Platform with no internet connection.